Ian Fleming, and his creation James Bond are very much on my mind these days. Fleming and I share a birthday, and tomorrow, the 28th, marks the centenary of Ian Fleming’s birth. Fleming (and therefore Bond) had their own brand of cigarettes. The Morland’s specials were a blend of Balkan and Turkish tobaccos and the filter carried three gold bands, indicative of Fleming’s (and Bond’s) rank of Commander in the Royal Navy. I can’t imagine anyone doing something like that these days. Well, that’s not entirely true. My latest endeavor is developing a special blend of coffee for the house. This began when I visited my local coffee shop/roaster for a pound of their “Stir Crazy” blend. As a member of their coffee club, the pound (my twelfth) was free. Now, I really like “Stir Crazy,” a blend of Brazilian Santos and French Roast, and so I asked the shopkeeper to mix me something I might like as much. We settled on a blend of 1/2 French Roast and 1/2 Sumatra, which I brew in my French Press to great results. The bold hit of French is softened by the smooth finish of the Sumatra. Give it a try. Why settle for whatever comes in the vacuum bag at the local supermarket? Mix your own house blend. Me? I’m just starting to think about the bag…. This entry was posted in Living and tagged coffee, Living, recipes. Bookmark the permalink. My dad’s b-day would have been tomorrow, too. Happy b-day to all the fun men born on that day! And there’s nothing like a french press for making coffee. I got one about 20 years ago, and have used it at home ever since! Great post. I think custom coffee (and tobacco) is a wonderful idea. I’m not a coffee drinker. Perhaps the same thing can be done with tea? Hello LBT, I don’t see why not. We also have a tea salon here in town. I’ll make a note to check in. Anon and Dear Fairfax, thank you. I began it with a 4.2 mile run (a mile/decade) If I make it to 260, I will be the world’s oldest marathoner. Please enjoy the day as much as I will. Happy Birthday, C.! And a fantastic way to begin your day, both the custom blend and the run. 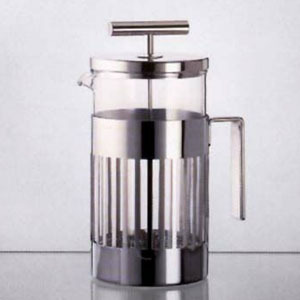 The Alessi French press is beautiful, and will have to try your suggested blends, although I have been known to have a few of my own . . . I can just see it now, a book with all your favourites blended, so easy and elegant. Now do tell us what the cake was? Chocolate mixed with framboise or ? TIG, care to share a few of your favourite blends with the readers? Mrs. PvE, I don’t have a sweet tooth …. but there were individual pecan pies with vanilla ice cream last weekend when we got to celebrate. Mrs. E. had a commitment last night, we went to lunch instead (Cava, shrimp and artichoke salad, espresso…) I actually spent the evening watching the kids and the most underrated Bond film “On Her Majesty’s Secret Service” which features Diana Rigg as the most fully developed woman character in the series. In retrospect, it may be fast becoming my favourite film of the franchise.